It is my pleasure to be here for the Second China-UK CEO dialogue. I offer you warmest congratulations from the Chinese Embassy. This dialogue happens at a time when China-UK relations are making good progress. It is the same case for our business ties, where a new momentum is building up. There are three primary driving forces behind that momentum. The first driving force comes from more players in the game now. Many people in this part of the world tend to think all big Chinese enterprises are state-owned. It is high time for that impression to change, not least because the gathering of Chinese entrepreneurs we have here today. The private sector accounts for over 60% of the Chinese economy and fixed asset investment. Private businesses are growing stronger and bigger in China and they are also making investments in overseas markets. 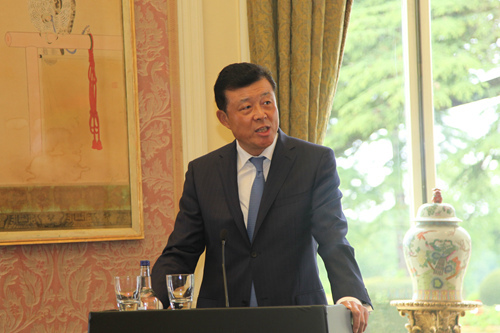 · Huawei is increasing its investments in the UK. · Geely has acquired Manganese Bronze Holdings, maker of the famous London cab. · Dalian Wanda has taken over Sunseeker, the yacht maker. · Sanpower from Nanjing is acquiring the House of Fraser. · And ABP is developing the Royal Albert dock in London. All these Chinese companies are from private sector. 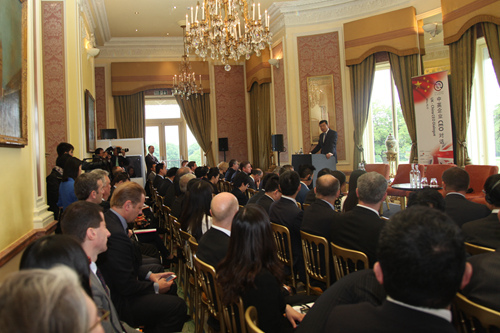 China-UK business ties will grow stronger as China's private sector invests and operates more on a global basis. Today’s gathering speaks out aloud about one truth. That after many years of development, the business model between China and the UK is no longer just built on cost factors. It used to be the case that China offered price-competitive labour, land and policy incentives. The British side of the bargain comes in the form of capital, technology and market. That was a good start, though a modest start. Now we have moved up the value chain as represented by this dialogue. The focus is increasingly more on creativity and compatibility. Both sides now contribute capital, products, services and ideas. This combination promises a brighter future. In this context the UK is now a growth leader in Europe when it comes to doing business with China. • In the first 4 months of 2014, UK has reclaimed its title of the 2nd largest trading partner of China in the EU. • The UK is, beyond any doubt, a most favoured destination of Chinese investment in Europe. The last but not the least driving force is the one being built up and represented by this CEO dialogue. The first step is usually the hardest, but the second is more important for the journey to continue. The hardest first step was already taken late last year in Beijing, and this more important second step, thanks to all your contribution, is a reality today. I have learnt that in addition to discussion on selected topics, you will also have commercially driven one-to-one discussions. That tells how well organized and prepared you are for this event. You do not only come with ideas and projects to be discussed, but also with targets and solutions to be delivered. In that same spirit I hope that at the conclusion of the second dialogue you will have solid outcomes that lead to contracts. · I have BEEN there! · And I have DONE that!